Use single HIGH STEPPER for height of 18"; or stack for adjustable height of up to 30". Quick and easy-- on and off. Comfortable and easy to walk around and work with. 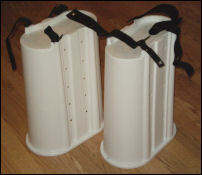 More uses than traditional drywall stilts. Useful in all phases of construction. ** ATTENTION: Steppin Up Inc. will not be responsible for any injury and/or accident as a result of irresponsible or improper use or failure to adequately maintain and inspect the High Stepper. ** WARNING: Not intended for weight exceeding 245 pounds.